I continue to get several phishing/scam emails, so I thought I’d share them with you to help you know how to recognize them. A scam is “fraudulent scheme performed by a dishonest individual, group, or company in an attempt obtain money or something else of value” according to the Business Dictionary (2). The examples below appear to be from the trusted businesses: FedEx, USPS, and Earthlink. But if you look at the sender’s email address or other clues in the screen-caps of the email text, you can tell the sender is pretending, in an attempt to gain your trust and get your information. “crickn827 (at) amega (dot) com”. 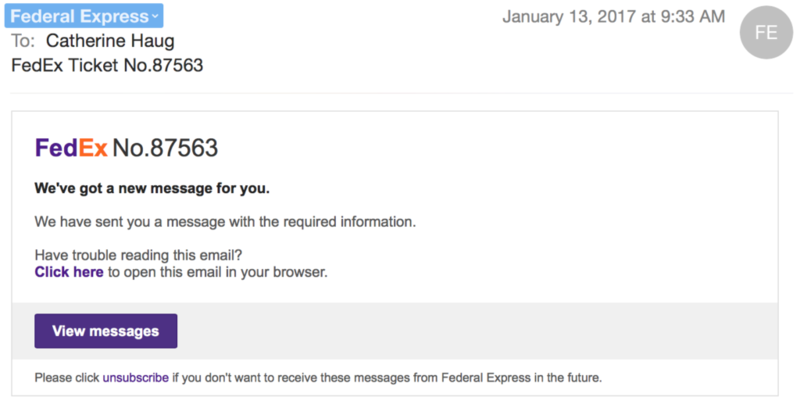 If it were truly from FedEx, the text after the @ would indicate: (at) fedex (dot) com (email addresses disguised for security). I put this email in my junk folder so I could shred it. If it were really from USPS, the part after the @ would be “@ usps (dot) com” (email addresses disguised for security). Like the previous example, I put this email in my junk folder so I could shred it. (ignore the “change size of message area” message superimposed over the email screen cap by my computer). 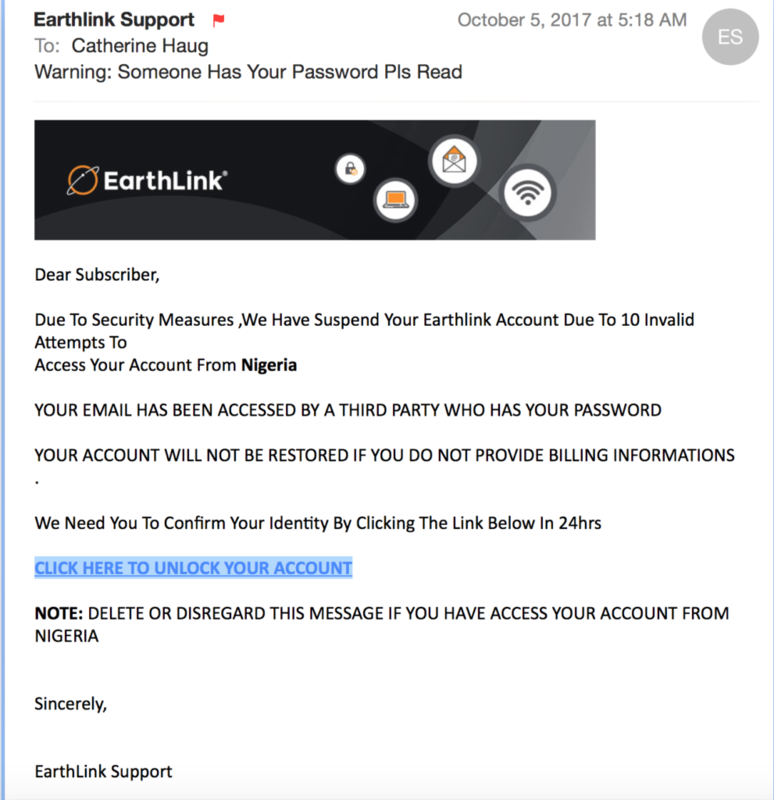 This phishing example claims to be from my email provider, Earthlink (but similar examples are likely happening for other email providers). It is phishing for my billing information (credit card, etc.). First, I looked at the sender’s email address by clicking on the sender name (Note: I added a space before the dot, to disguise it for security). It appears to be valid, but I didn’t stop there. There are at least 2 clues here that it is fraudulent. The most glaring is the ‘http.’ Any valid business wanting your billing information will use a secure link indicated by ‘https’. It is also missing the ‘//’ after the “http:” The second clue is that the sender is ppcassistants’ not earthlink. Yes, earthlink might have hired an outside company to do this for them, but I don’t believe they would do that. Third, I studied the writer’s text. I believe this was written by someone who doesn’t speak English as a first language, because they typed: “PROVIDE BILLING INFORMATIONS .” Correct wording would be “PROVIDE BILLING INFORMATION.” (‘information’ should not be plural). Fourth, while studying the text, I note they tell me to disregard this if I access my account from Nigeria. That means they are from Nigeria, one of the countries from which most phishing originates. Lastly, I forwarded it to their fraud department (I looked-up that address online). alternately, I could contact earthlink’s support, to find out if this is valid. I opted not to do that because I’m certain this is fraudulent. If you have a different email provider and get a suspicious email, contact them regarding how to report fraud. 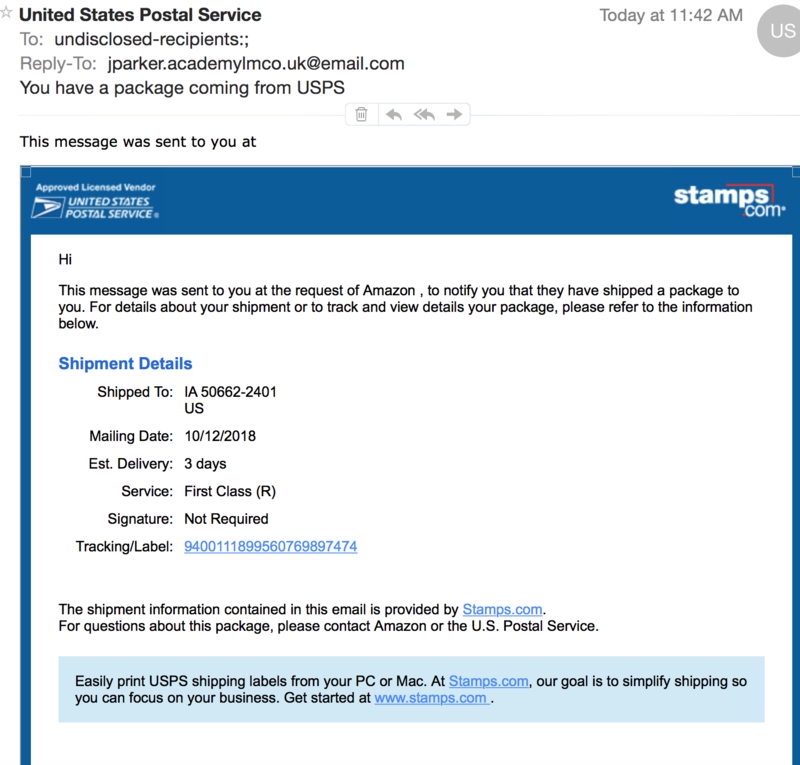 This phishing/scam example claims to be from a person in the UK representing Amazon and USPS. 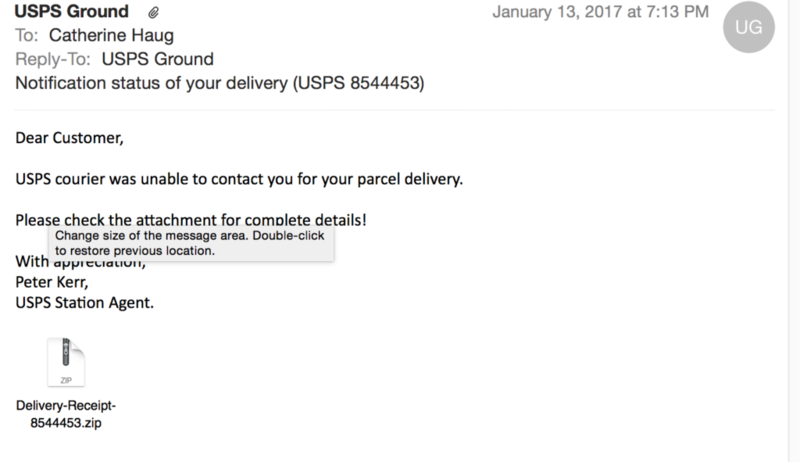 I believe it is fraudulent because the sender’s email address (which I got by clicking the sender name, “United States Postal Service” doesn’t look right to me. That address is “sender2 (at) alpha tiles (dot) co (dot) uk” [I disguised this and other addresses/urls for your protection]. I have not placed any orders from Amazon in months. The sender purports to be from USPS but says in the text of the email that shipment info is provided by stamps (dot) com. and the reply-to address [jparkeracademylco (dot) uk (at) email (dot) com] is neither of these companies/shippers. Note that I disguised the url and email address for your protection. The tracking link doesn’t appear to be legit for USPS, and begins with “http:” rather than “https:”. The latter would indicate a secure link, the former does not. This entry was posted on Tuesday, October 10th, 2017 at 11:41 am and is filed under Security. You can follow any responses to this entry through the RSS 2.0 feed. Responses are currently closed, but you can trackback from your own site.